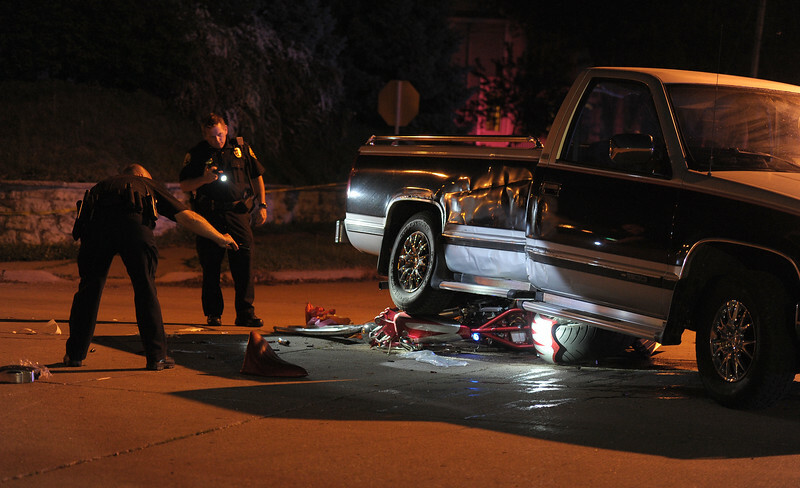 Moline police officers use flashlights to light up a crushed custom motorcycle under a Chevrolet pickup in the intersection of 15th Street and 13th Avenue on Wednesday. The motorcyclist was taken to a hospital for severe head injuries and multiple lacerations after striking the driver's side of the pickup at 8:32 p.m., according to police. Police said the motorcyclist was traveling north on 15th Street when he struck the truck heading west at the intersection of 13th Avenue. Police said they did not believe the motorcyclist was wearing a helmet. No further details were available Wednesday night; the investigation is ongoing, police said.